A hotsite for the new Code Geass animation project Code Geass GAIDEN: Boukoku no Akito has been launched. The hotside doesn’t have much new information, it possibly has the same contents published in this month’s Newtype magazine (see scan below). 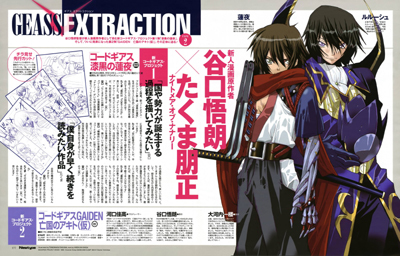 Both hotsite and Newtype point out that the title Code Geass GAIDEN: Boukoku no Akito is a tentative title, which may or may not change. The characters in the article are Renya (from the Code Geass manga adaptation Code Geass: Shikkoku no Renya) and Lelouch. Doesn’t necessarily mean that they will be in the new anime project. The format or release date for Code Geass GAIDEN: Boukoku no Akito have not yet been revealed. So.. Lulu is still in the anime. Not necessarily, I think that is just a random illustration featuring the two main characters of the anime and manga series. But I doubt Lelouch won’t be in the new project, even if it’s only a cameo. And just what is wrong with this anime style? The character designs are all done by Clamp originally so they will all look similar to Tsubasa, CCSakura, and xxHolic. I see nothing wrong with that. Lelouch either faked his death… or he’s in hell and presumeably took over the place in very short order (at least, that’s my theory). Either way, if we see him, it’ll definately be interesting. A little correction, Yuuto-san: it’s almost impossible for Ren’ya to be on this new anime project, since he’s from feudal Japan, which we can say is waaay long ago from atb 2017. Seriously their just messing with our heads no way this starts before next April,next picks going to feature C.C or a Clamp illustration so we can start biting our fingers of! That’s Lelouch or the “Mysterious Man” who looks like Lulu in Renya’s manga? xet! I thought its Code Geass: Shikkoku no Renya! i|Im stil confused! Please someone explain it to m3! maybe shikkoku no renya is still the same era as lelouch’s. they have Gino Weinberg there and also nightmares. what if the people where renya lives is some kind of technology-less village or island? remember what happened in CGr2? I first thought that everything repeated itself with a different story but as i watched i discovered that it’s the continuation. I think the movie will be better, considering that Saya has awaken and everything. well this is not clear , is it really r3? I doubt it. you can check out manga Code Geass: Shikko ku no Renya. hope this will be useful. to be frank, i was really dissappointed with how r2 ended but still it is my favourite anime ever. lelouch is`t dead, however there is no information about other characters from r1 nd r2 except for cc,nunnaly and a few others…so at last check out the manga above. farewell!!!! !